Rule 3: The submitter of a star that holds the current record for more then 3 days will be able to select a name for that star. The name of the star will stay even if a larger star has been found. Rule 4: Any star lasting as the record for an undisclosed amount of time will gain a +1 Reputation point commending you for the discovery. This is an All Time challenge, post your biggest stars and proof of Diameter, and I will keep updating this list depending on their size. After you submit I will personally visit the star system and confirm it and then place it in the list if it beats any of the top 5. Be sure you select the star itself, not the system barycenter (SE may show incorrect diameter in case of binary star). Make selection using F2 system browser. I just went on a 40 minute journey scanning many many galaxies, I can't seem to find anything bigger then the 10.447 AU Giant (pic in OP). But my method might be flawed, because I've found some 10.00 AU giants that are very very dim compared to others, so maybe I'm looking in the wrong areas since up magnitude to see star structure of galaxy. 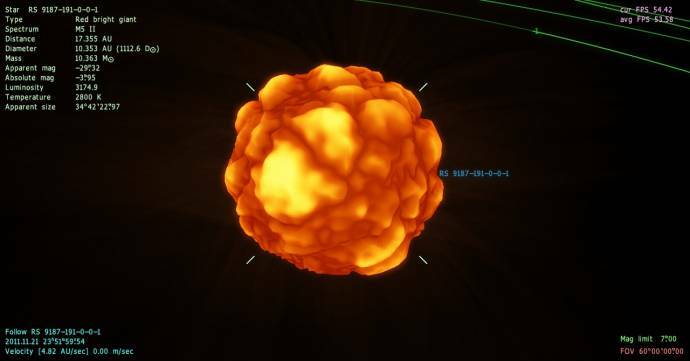 That is not a procedural star, you have select its barycenter (not the star itself). I know this does not qualify but still bigger than anything on the list. You have selected the baycenter not the star. He selected the star. His camera is following the barycenter, but the star is selected. Welcome to the SpaceEngine community. Please read this post here for newcomers. The first 3 paragraphs apply: Note that large images must be contained in a spoiler button. Great stuff, congratulations on beating the record, if your star is still at the top in 3 days you can give it a name it will always be known by. Also, like Robbie said please use the spoiler tags to hide your images as they stretch the page. Well done amwhere, I have updated the list again. RS 2884-363-0-0-15, in NGC 2008: 10.694 AU. I once found a 12 AU-sized star... but I didn't take a pic of it. Nice, yes I remember finding a few 12 AU+ stars back in 0.94 but It seems the generation has been changed a bit, I wonder if this list will break 11 AU. Theoretically there should be stars (extremely rare few) that can be around 25 AU.